This week, the news broke about Cambridge Analytica and the data mining and online persuasion tactics that it’s used to sway elections around the world. That, combined with the ridiculous non-linear algorithm that feeds us information, is enough to make you want to unplug altogether from what’s looking more and more like The Matrix everyday. But that’s not what social media is all about. It’s about like-minded people from all around the globe connecting, sharing ideas, and inspiring one another. This is the case with Poisoned Pen—an Instagram account started by Martin Orton in Barnsley, UK, when he became a stay-at-home dad to care for his son with autism. 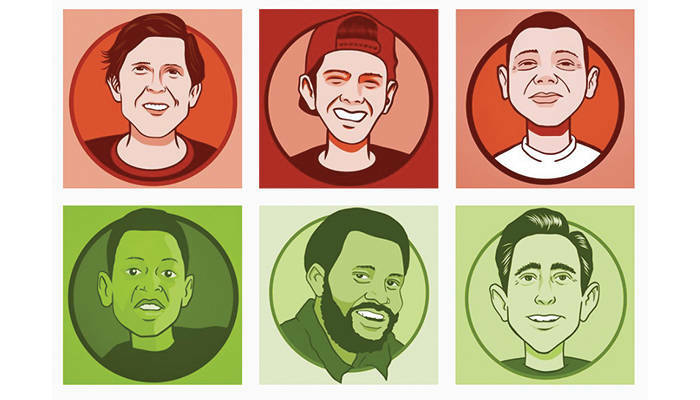 As a longtime skater, Martin took up creating vector portraits of pros from his glory days in the ‘90s to pass the time while his son was at school. The result is something spectacular. We stumbled across the account this morning, and were so amazed by Martin’s work that we had to reach out to find out more about his process. Start with a little bit about yourself. How old are you, and what’s your history with skateboarding? My name is Martin Orton. I’m 44. I started skating 33 years ago, back in 1985. I was on and off until I saw Public Domain . That video, particularly the Saiz, Sanderson, Barbee, and Thomas section, was a total eye-opener. I went from little kid wanting to be Marty McFly to becoming what would be a committed lifer. Since then, everything, one way or another, has come to me through skateboarding. What about art, when and how did that come into the picture for you? It’s something that I’ve always been able to do and enjoyed doing. The thing with skateboarding in the UK is that you are at the mercy of our volatile weather. Rain has strengthened all other creative expression over here, which is why so many skaters that I know and know of have other outlets to pursue when life gets in the way. If I wasn’t skating, I’d always have a pen and pad. How did Poisoned Pen come to be? I have an autistic son whom requires support. I basically quit my job to become his full time caregiver. In the downtime when he was at school, I started sketching again like I used to prior to becoming a parent. I bought myself an iPad Pro, as digital art is something that I had never tried and always wanted to explore. Working in layers and vectors was a revelation for me and the process, although I’m still finding my feet, is something I feel completely attuned to. The progression from sketching and drawing was to get it out onto social media and share with others that had been so inspiring to me. Behance and Instagram are great for that. That’s how Poisoned Pen came about. What made you decide to start doing the series of skater portraits? Paying it back to all those that had been so inspiring to me back in the day. Just an homage, really, and a thank you. What is your process for creating these images? Usually, I’ll get inspired by something I see from other artists on social media. Check out Derek Michael Brennan on Instagram—he has been doing these rad trading cards of Heath Kirchart, Andrew Reynolds, Jason Lee, and so on—really amazing! I’ll see what he’s up to and get inspired. Another dude that is ridiculously good is Thatcher Hilegas. He gets commissions from DGK a lot. He’s a massive inspiration. You seem to be focussed on people from a certain era thus far. Any particular reason behind that? Yeah, they’re all more or less from the ‘90s. That was the golden era for me. Again, paying it back. Correct me if I’m wrong, but the style on some of these seem to be partially influenced by Marc McKee’s Garbage Pail Kids series for Blind. Are you drawing any inspiration from old graphics? Absolutely. McKee and Cliver are an unashamedly massive influence on me. I’m still in awe of their work to this day. Everything they put out was instantly iconic. I wish I had the foresight to hang onto the old World/Blind/101 boards rather than skate them. I’m thankful for reissues! I really hope that the Adam McNatt Charles Manson/Peanuts board gets a reissue. That is my grail. Do you have a favorite from the portraits you’ve done so far? It’s always the last one I’ve done, so that’d be Kareem Campbell. Shiloh Greathouse just sent me a rad shot from his World Industries days that I’ve just started. I’ll get that posted up later on today. There’s a full body drawing of Ray Barbee that I’m happy with. What’s your connection with skating these days? Do you still skate or pay attention to what’s going on with it now? Life, ultimately, got in the way of skating everyday. In a good way, though. I’m happily married to my best friend, Lara. We’ve been blessed with three sons that are into skating. So I get to take them to The House Skatepark over in Sheffield at least once a week. Watching them progress and seeing how happy it makes them is its own reward. It’s good to cruise around, too. How, if at all, has skating influenced your life on the whole? I’ve made lifelong friends through skating. Music, fashion and art have all been shaped by it. Skating has informed my outlook on so much of my life. I hope it continues to do so for me and also my sons, Ewan, Heath, and Eli.